Klout hasn’t just defied influential tech pundits, its social reputation scorecard has won them over. Now the sometimes-controversial startup is aiming at search. The startup has just signed a strategic investment and partnership with Microsoft that, on top of new funding, will create a product and business relationship with the Bing team. You’ll begin seeing Klout scores — the combined measure of a person’s influence across Twitter, Facebook and other social networks — show up in the search engine today. 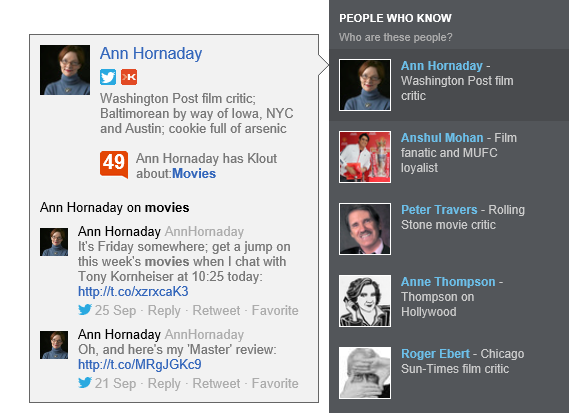 The initial implementation will show Klout scores for friends in the “People Who Know” section of the right-hand column, alongside other third parties already in there, including Twitter and Quora. Search for a hot topic like “Facebook advertising”, you’ll see people with socially-proven expertise showing up. Mouse over an expert’s name, and their Klout score will appear, along with their Klout-determined areas of expertise. 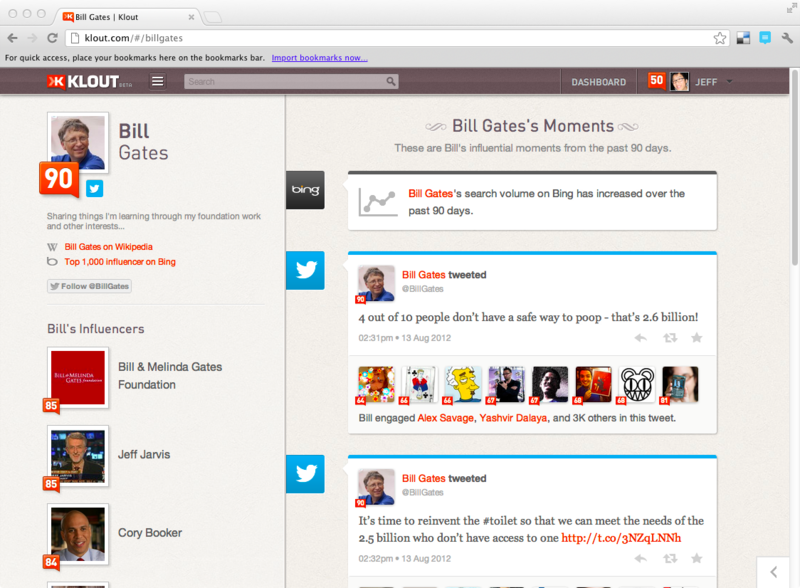 Meanwhile, search data in Bing will now begin contributing to Klout rankings. Klout users who have Wikipedia entries associated with their accounts will also get Klout boosts for the number of times that those entries show up and get clicked on in search results. For Microsoft, this is another move to define itself as the “open search platform” — a term that Bing corporate vice president Derrick Connell used repeatedly during my briefing call today. As with the Facebook, Twitter, Quora and even Google+ integrations, Klout helps position Microsoft as the more open and socially-attuned alternative to Google’s still-dominant search product. The deal today isn’t exclusive for either party, both sides confirmed with me, so maybe we’ll see Klout start becoming a factor in Google rankings. But so far the search giant has appeared more focused on using Google+ data to power social relevance in rankings. Klout, meanwhile, gets traffic and brand marketing from yet another big name, and money (both funding and revenue). I don’t have the exact terms, but this type of relationship reminds me of Microsoft’s now-legendary strategic investment/partnership with Facebook back in 2007. Speaking of Facebook, founder Mark Zuckerberg has recently started talking about expanding his company’s own efforts in search. But both Bing and Klout use Facebook as a core way for determining relevancy in their services (you’ll even have to sign in with Facebook to get access to the Klout integration). I have to wonder if there’s any friction emerging here between the companies? Anyway, for now, this looks like a mutually beneficial win for all parties versus their shared enemy.